Note: You might want to check out my proper review for The Girl with the Dragon Tattoo before continuing reading this post. In a filmed interview with David Fincher for Sweden’s leading newspaper Aftonbladet, the reporter made mention of the fact that the director’s The Girl with the Dragon Tattoo was the most expensive movie production to have ever taken place in Sweden. Fincher seemed genuinely surprised and expressed embarassment over this, as though the thought had never crossed his mind. For him, a film with a budget of $90 million didn’t seem like a big deal – although to be fair, he does go on to say that he hates how making a film has to be such a huge project. Regardless: In Sweden, numbers like $90 million are unheard of. This country I call myself a citizen of has never been a hotspot for foreign filmmakers, least of all those in Hollywood. When George Clooney came here a few years ago to shoot the 10 minute opening segment for Anton Corbijn‘s The American, it was enough to garner nation-wide news coverage. And that was for a short sequence in a comparatively small arthouse-y film. So a big-time American production like The Girl with the Dragon Tattoo being made entirely in Sweden is rare. I can honestly say that watching the film was a unique experience for me, although not necessarily in a good way. Here we have Mr. James Bond himself, Daniel Craig, watching a news report on the Swedish channel TV4 with its classic logo on screen. 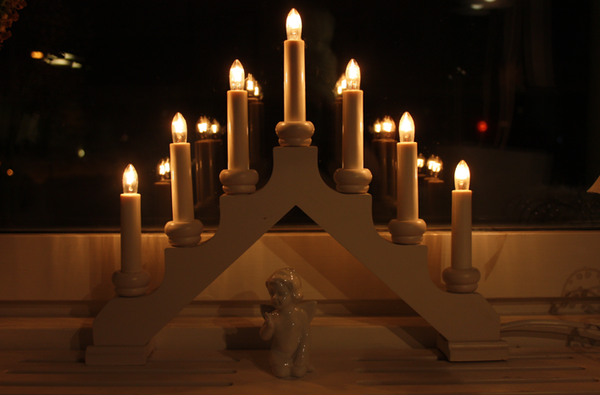 Now he’s in his office, with the traditional Swedish Christmas candelabras in the windows. Oh look, now he’s bording a train with the national railways company SJ’s logo on it. At times, the framing of certain shots seemed to be deliberately emphasizing these things so iconic to us Swedes. Maybe that’s just my imagination playing tricks on me, but the end result was a mild sense of distraction. Why do all this? As easter eggs to the Swedish viewers? As I noted in my review of the film, all these details make for a very accurate depiction of Sweden, but it’s weird having them side by side with a big foreign star like Craig. More annoying were the inconsistencies with regards to written text. Throughout the film, you see plenty of books lying around. These have Swedish titles clearly printed on the front. Fine. But then there are plenty of newspaper clippings where everything is written in English. I get that the articles and headlines are more important to the story than some random books that are essentially just set decoration, and that it’s crucial to convey their message to the audience, but it quickly became another source of distraction. There are other things as well that suffer the same fate, such a news report on TV towards the end of the film where a large sum of money is mentioned. The money is measured in euro, again to give foreign viewers some idea of the quantities being discusses. Nevermind that Sweden hasn’t adopted the euro as currency and that we still use our old krona, which is the currency money is measured in in real news reports. This is admittedly a minor quibble, though. And then we have the spoken language, which is always problematic in English-language films set in non-English-speaking countries. I have never been a fan of the “English with an accent” approach that’s often utilized. All too often, the character gets lost in the dialect to the point where the dialect becomes the character and everyone sounds exactly the same. One example of many is The Illusionist (2006), set in Austria around year 1900 where everyone speaks English with (I assume) Austrian-sounding accents. Yes, I get why the English language is used: because Americans hate reading subtitles. But filtering English through accents adds no sense of immersion for me, because I’m still fully aware that the characters wouldn’t be speaking the language at all. I would be much happier if the actors would just use their normal voices instead, as that way they’d be able to provide more nuances to their characters. I suppose that’s why I have never been bothered by Kevin Costner‘s performance in Robin Hood: Prince of Thieves like so many others have. He hardly ever bothers to use a British accent in that film, instead speaking in a voice more comfortable to him which allows him to exhibit a bit more range. So The Girl with the Dragon Tattoo takes place in Sweden with Swedish characters who speak English. I’ll concede that this film uses the method better than most do. The Swedish supporting actors all do a fine job with this. The oldies speak English the way old Swedish people tend to speak English – with a particularly jagged accent referred to by some younger Swedes as “politician English”, after a long line of Swedish ministers who have learned the language in school but never spoken it much until they find themselves at international conferences and such. Then you have some characters in the film who speak it a bit more smoothly, such as Martin Vanger (played by Swedish actor Stellan Skarsgård). This I can buy, as that character struck me as the type who might have more international connections than others and is thus more well-versed in English. 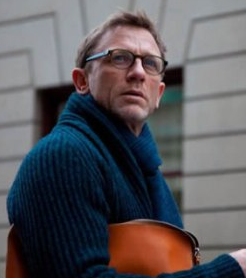 Daniel Craig doesn’t bother with a whole lot of accent either, which again I’m fine with; his character Mikael is a journalist who has presumably spent a lot of time researching and interviewing people from foreign countries. This isn’t explicitly stated, but I can believe that. But then we have Rooney Mara in the central role of Lisbeth Salander, who is definitely heavily accented but in a “wrong” way. Hers is either a massively failed attempt at sounding Swedish, or a subtle hint at future developments in the planned trilogy. I know that nobody in this film makes any mention of her odd way of speech, though. Another confusing language issue: nobody ever says “cheers” or “toast” when drinking in the film. They all say “skål”, the Swedish equivalent. Only to then revert immediately back to English. Puzzling. Another small thing like that is a particular greeting Lisbeth uses as she enters her and Mikael’s base of operations a few times: “hej hej” she says, which is certainly a Swedish greeting but one that A: doesn’t quite fit the character, and B: is another out-of-place Swedish expression used amid all the English. This might all seem like nit-picking. It probably is. None of it is likely to have much effect on the enjoyment of the film for non-Swedes, and Swedes are but a small percentage of the total audience for this film. As I’ve said repeatedly throughout this post, I understand why most of these things are in the movie. That’s why I didn’t make any mentions of them in my review. I don’t know how much these distractions influenced my fairly negative opinion of the film. I’d like to think that I was able to look past them. I certainly had issues with the film that weren’t related to the minor details. Should I care about these things at all when I’m often willing to look past them in movies set in other countries? Amélie is one of my favorite films, yet French people have criticized it for its lack of colored characters when it’s set in Montmartre, a highly multicultural part of Paris. I find Amélie to be a wonderful film regardless. I’ve never been to France. There is nothing in the film that conflicts with the world as I have experienced it myself. Can I justify Jean-Pierre Jeunet‘s decision to not have any character in Amélie have dark skin? No. But I can easily ignore it. Ignoring things does not make them go away, though. The difference between inaccuracies in Amélie and ones in The Girl with the Dragon Tattoo is that I’m acutely aware of the ones in the latter due to personal experience, whereas those in the former I only learned about from external sources. As I said earlier in this post, foreign movies being set and filmed in Sweden is extremely rare. I’ve never had a reaction to a film before like I did with The Girl with the Dragon Tattoo. This is why I chose to write this blog post. Maybe this isn’t something that interests you, but it interests me. I like finding out others’ views on films set near where they live. I would love to know what Iraqis thought of Three Kings. What Jordanians thought of Body of Lies. What Spaniards thought of Vicky Cristina Barcelona. By learning about other people’s opinions, I can see the world in different lights. Even if it is just over small details in a film. A closing note: Many reviews of Fincher’s The Girl with the Dragon Tattoo compare it to the Swedish film from 2009. I chose not to do that in my review, saying that since Fincher’s is a readaptation rather than a remake, it deserves to be judged on its own merits. It does. I will say here that I liked the Swedish movie much better, although this later film has made me question whether the first one really was as good as I first thought, seeing as some of the flaws appear in both of them. I will also say that Rooney Mara’s Lisbeth, while its own character, is far less intriguing than the one played by Noomi Rapace. The American movie doesn’t do enough things different from the Swedish one to really warrant its existance. I hope Fincher doesn’t sign on for the sequels. There are better things he could use his talent on. The Girl with the Dragon Tattoo felt like a big enough waste of time as it is. Posted by Emil on 26 January, 2012 in Misc.